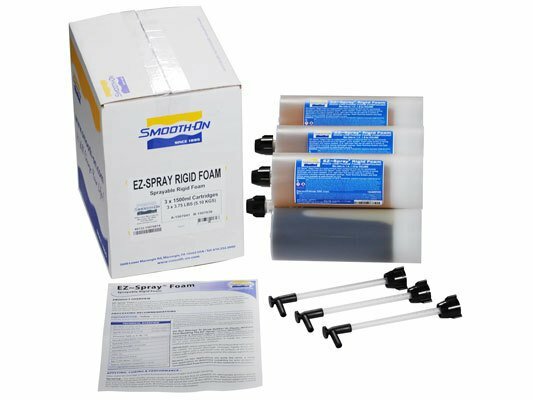 NEW EZ-Spray Rigid Foam case of 3 cartridges (1500 ml). EZ~SprayÃ¯Â¿Â½ Foam is a polyurethane foam compound that can be conveniently sprayed using Smooth-OnÃ¯Â¿Â½Ã›Âªs EZ~SprayÃ¯Â¿Â½ Junior System. Foam cures quickly to strong, lightweight and impact resistant 12 lb. rigid foam that can be used for a variety of applications including making lightweight castings. Foam can also be sprayed over certain rubber mold configurations as a mother mold material. 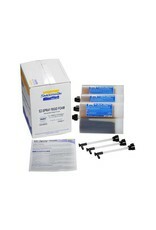 Yield - Each cartridge contains 3.75 lbs. (1.7 kgs) of material. Assuming a thickness of 3/16 of an inch (.45 cm), expanding to about 1 inch (2.54 cm) thickness, one cartridge of EZ~SprayÃ¯Â¿Â½ Foam will cover approximately 3.75 sq. ft. (0.35 square meters).